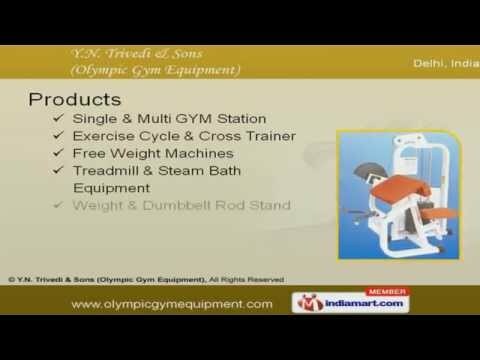 Wele to Y. N. Trivedi & SonsManufacturer & Supplier of GYM & Body Building EquipmentsThe pany was established in the year 1997. Our International quality standards &High-grade raw materials help us to cater Delhi police, Air Force & Army. Superior quality, defect free & Timely delivery schedule are the factors that help us tostay ahead of our petitors. We offer a wide assortment of Exercise Cycle, Cross Trainer & Multi GYM Station. Our Single & Multi GYM Station are in huge demand across the global markets. Exercise Cycle & Cross Trainer offered by us are available at industry leading prices. Our Free Weight Machines are well known for their outstanding performance. We also provide Treadmill & Steam Bath Equipment that are a class apart. Along with that we offer Weight & Dumbbell Rod Stand that are well known for theirdurability. For more information log on at: http://www. olympicgymequipments.